Newbound's API is based around two core layers: An HTTP API for local operations, and a peer-to-peer (P2P) protocol for sending commands, responses and streams between devices. The HTTP service defaults to port 5773. The P2P service picks a random port the first time it starts up. Don't worry, though... both ports are configurable! Typically, your app's back end code is going to use the P2P interface and your app's user interface (which lives in a web browser) is going to use the HTTP interface. Since both interfaces can talk seemlessly with each other, you are able to acheive direct, secure, encrypted P2P connections between two remote web browsers behind different firewalls over the Newbound protocol. The Newbound API utilizes a REST-like interface to enable you to do these core functions and many more. Method calls are made by sending HTTP GET or POST requests. Response data is returned in JSON format. When you use the MetaBot app to build apps, the HTML5 user interface depends on jQuery and Newbound's api.js, both of which are included with the basic installation. 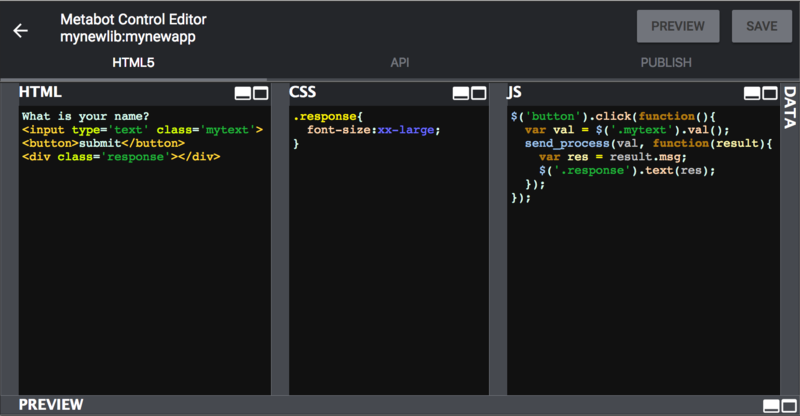 The api.js script is the glue that turns the Controls you write using the MetaBot into an app. When you publish an app using the MetaBot it will automatically generate an index.html file that includes jquery and api.js for you. You may, of course, edit the files the MetaBot generates to your heart's content. By default, api.js opens a web socket to the back-end and sends all commands over the web socket instead of using AJAX. View the list of apps installed on this system. The settings panel provides some additional system-wide options. compile db, id, cmd, java, python, js, params, import, returntype, readers, writers, sessionid Compile the given command. db, readers, writers, encryption, sessionid Convert the permissions and on-disk encryption for this library. Currently supported encryption types are AES and NONE. db, id, sessionid Delete the given record from the given library. discover Return the list of peers available on the local network. db, id, args, sessionid Execute the given command. getsettings issetup, defaultbot, discovery, machineid, portnum, requirepassword, syncapps, password All parameters are optional. Get or set basic system settings. List all currently running apps. db, readers, writers, encryption, sessionid Create a new library with the given name, encryption and permissions. If permissions are not specified, admin access will be required to access the library. Currently supported encryption types are AES and NONE. List the primitive functions installed on this device. db, id, sessionid Read the given record from the given library. restart Restart the Newbound Network on this device. savejava db, id, cmd, java, python, js, params, import, returntype, readers, writers, sessionid Save the given command. savepython db, id, cmd, java, python, js, params, import, returntype, readers, writers, sessionid Save the given command. setdeviceinfo Deprecated. Do not use. startbot Deprecated. Do not use. timer id, mode, params Administer timer rules. Supported modes are 'get', 'set' and 'kill'. db, data, id, readers, writers, sessionid, sessionlocation Write the data to the given library with the given permissions. If no record ID is provided, a unique one will be assigned and returned. The user who writes the record has default read access. If permissions are not specified, admin access will be required to access this record otherwise. 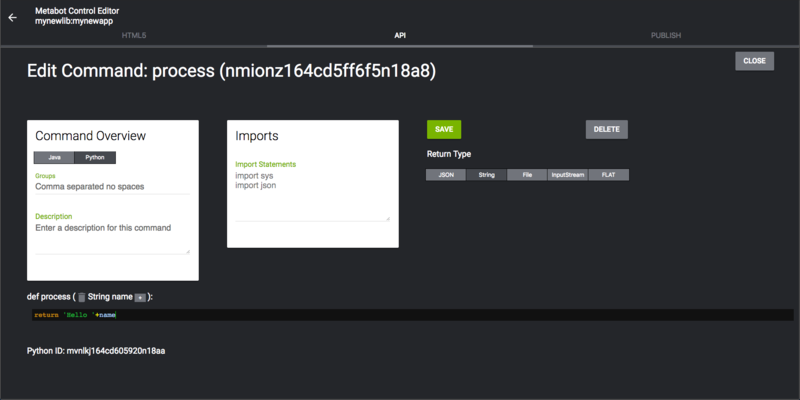 The Blockchain application provides a drop-your-code-in-here approach to writing blockchain apps. The documentation for this crazy software, man. Send secure private email over the Newbound Network with the built-in webmail or your favorite email client application. accounts List all of the email account information that this device receives mail for. addaccount id, userid, email, server, port, username, password, status, type Add new email account to receive email. Retrieve email attachment as a file. List all of the email addresses that this device receives mail for. Retrieve current account information for webmail. getemails Get the list of email addresses this device can send to over the Newbound Network and their device ids. id Retrieve an email message. Returns the primary email gateway for this device. page, pagesize Returns email message metadata from the current account. stream, sessionid Accept an incoming POP3 request from the connected peer via the given stream ID. to, len, msg, sessionid Receive message from peer via new stream. Returns stream ID. savesettings id, userid, email, server, port, username, password, status, type, smtpport, pop3port, smtprelay, pop3relay Update email server settings. from, to, subject, text, html, attach Send an email. setemails emails Update list of email addresses this device can send to over the Newbound Network and their device ids. settings Retreive email server settings. stream, sessionid Accept an incoming SMTP request from the connected peer via the given stream ID. user, pass Switch the current account for webmail. updateaccount id, userid, email, server, port, username, password, status, type Update email account to receive email. name, file Upload attachment file. Returns attachment id used when sending the email. Use the Feed Bot to monitor app events on your local device. Add custom Java code to transform the event data or send commands to other apps over the Newbound Network. 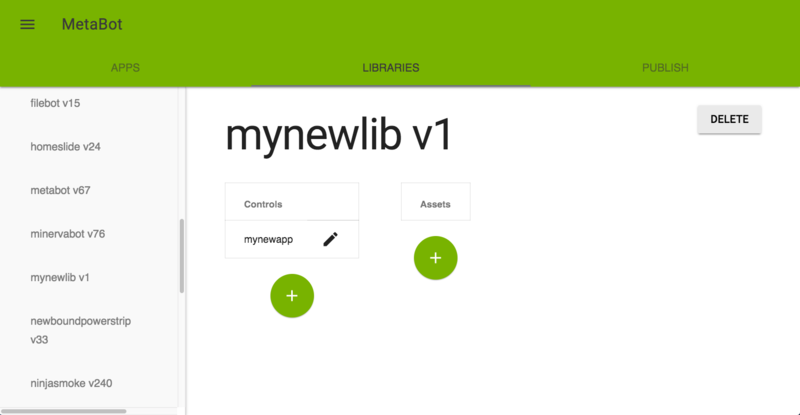 Share files with anyone on the local network and with other devices you are connected to over the Newbound Network. path Create new empty file at specified path. path Create new folder at specified path. path Delete file at specified path. path Delete folder at specified path and all of its contents. Returns a list of folders on the local device that people often share. Retrieve a file from a local share. name, path Create new folder with specified name inside the folder at the specified path. stream, path, sessionid Download a file asynchronusly from the given path over the given stream. opath, path Rename the file from opath to path. stream, path, sessionid Upload a file asynchronusly to the given path with the contents coming from the given stream. updatefileshare v Update the list of directories to share. name, path, filename, files Upload a file to the given path. NOTE: Requires enctype="mime/multipart" in the form tag. path Returns a ZIP archive of the folder at specified path and all of its contents. The app builder that built itself. It's totally meta. installapp metabot, appinfo Deprecated. Do not use. The Newbound web site was built, deployed, and is hosted by the MetaBot and the Newbound Network. Connect to the Newbound Network, download the Newbound Web Site app, and check it out for ideas for your own web site! Connect this device to other devices on the Newbound Network with a direct encrypted peer-to-peer connection. Choose other devices on your local network or anywhere else on the internet via a Universal Identifier. uuid, code Grant the permissions defined by the given access code to the given peer. accesscodes List all access codes for connecting to this device. addaccesscode code, groups, delete Define a new access code. Access code will be single-use if delete=true. allowanon allow Allow or disallow anonymous incoming peer connection requests. uuid Returns an error if the given peer is not responding. connect uuid, addr, port, code, groups Connect to a remote device. Optionally, you may pass a suggested IP Address and port number. You can also specify an access code and/or the groups you want to assign the device to. All parameters other than uuid are optional. List all of the devices the local device knows how to connect to. uuid Returns the connection status of the remote device. deleteaccesscode code Delete an existing access code. deletepeer uuid Delete an existing peer connection. disconnect uuid Disconnect from a remote device. Returns the universal ID of this device. Returns the connection information about this device. listzeroconf Deprecated. Do not use. Use botmanager/discover instead. Execute a command or http request on the local device. Used internally by the remote command. uuid Returns the connection information for a specific device. newconnection uuid, addr, port, code, groups Connect to a remote device. Optionally, you may pass a suggested IP Address and port number. You can also specify an access code and/or the groups you want to assign the device to. All parameters other than uuid are optional. uuid Returns the public key for the given peer. uuid, local, addresses, port, name Send information on how to locate yourself to another peer. Send a command or http request to a remote device. setpubkey uuid, pub Set the public key for the given peer. setreadkey uuid, key Set the read key for the given peer. peer, stream, connect Accepts a bidirectional data stream request with the remote device if connect=true, otherwise disconnects the specified stream. bot, channel, sessionid Add the requesting peer to the websocket subscriptions for the given bot and channel. id, sessionid Send the temporary file with the given ID to the requesting peer via a new stream. Returns the new stream ID. togglekeepalive uuid, keepalive Specify whether or not this device should attempt to remain connected to the given peer. peer, bot, stream Open a websocket connection on the remote device and attach it to the given stream. Toaster Simple™ secure private networking. Share your Desktop, printer, Minecraft server or anything else with an IP address and port number over the Newbound Network. addlocal ipaddr, port, name Share a local service. addremote peer, id, name, port, ipaddr, peername Start sharing a remote service. deletelocal id Stop sharing a local service. deleteremote id Stop sharing a remote service. Returns a list of local and remote shared services. id, stream, sessionid Begin portforwarding the given local share via the given stream with the requesting peer. Manage real world sensors and controls with the built-in dashboard interface, or create your own rich HTML5 apps with our powerful JSON API. Toaster Simple™ secure direct confidential audio between devices. Add users and devices to groups, and specify which groups have access to individual apps or app functions. currentuser Return information about the current user. deleteuser username Delete a user. deviceinfo requirepassword, syncapps All parameters are optional. Get or set basic security parameters. Turn security on or off, turn permission synching to defaults for apps on or off. List all apps and their current security settings. listgroups List all security groups. listusers List all users and peers. The "local" attribute is true for users and false for peers. newuser username, realname, password, groups Create a new user. resetapps Reset all apps to their default security settings. updateapp include, exclude, id, cmd Update the security settings for an app. All parameters are optional except id, which is the ID of the app you are updating. The include and exclude parameters are comma separated lists of groups. If the cmd parameter is passed, the include and exclude settings will be applied to that command. Otherwise, the settings will be applied to the app itself. updateuser username, displayname, password, groups Set basic information about the user. Just type in a website and click the button- The Webcrawler will download any files it can find there. Pull files from a page, part of a website, or the whole site. Use it in conjunction with the Feedbot and you can add any additional processing you like to the files as they come in. startjob url, dir, scope, types, includeothersites Begin crawling the given website asynchronously.